Once You Get Organized You Can't Go Back: Once you switch to organizing your home with these utility hooks keeping your home tidy and neat will be a breeze. Get organized and make your life easier. Keep Your Gardening Supplies Organized in One Place: With these hooks you can keep your garage and basement organized by hanging your tools. Great for hanging hoses, gloves, other tools and hardware, or other gardening supplies with ease. Create a Custom Coffee Station and Enjoy Every Sip with Ease: Keep your coffee machine, mugs and coffee in one place, organized and at your fingertips. Enjoy pouring yourself a cup of coffee with ease and keep it coming as everything is always organized. or use it as an entryway organizer to turn it into the ultimate welcoming space. Each Hook's Dimensions: 3.5", Arc 0.5", S Shape 1 ¼"
Strong and Well Made: Each hook is 3 1/2" inches and sturdy enough to hold a substantial amount of weight. Made with good craftsmanship the hooks will help you organize your home with ease and keep it tidy for years to come. Handy and Very Useful: Hang your most essential needs at your fingertips and organized in adequate fashion to make your life easier. Your kitchen counter, cabinets and pantry closet will forever remain tidy and neat. Great Kitchen Organizer: You can use these hooks on any wire shelving unit or kitchen rail, each one is great for hanging pots, pans, utensils, apron, oven mitt, gloves, measuring cups and spoons, so cooking and baking is no longer frustrating. Multipurpose Functionality: These hanging hooks can be used in the garage to organize gardening supplies, hardware and tools, in the entryway as a custom coat rack, or to hang your accessories, jeans and belts neatly organized inside your closet space. 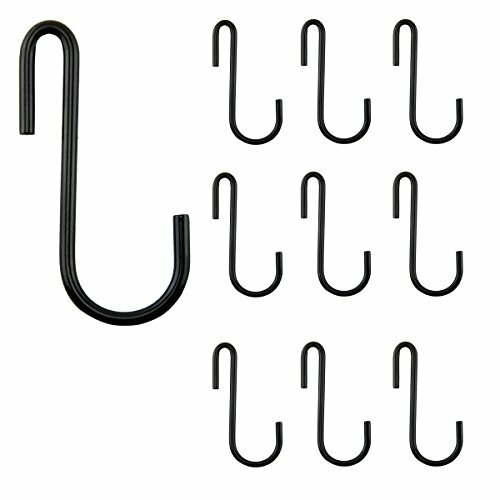 Affordable Bulk Purchase: You can't beat the price for this bundle offer of 10 hooks with just one click. You don't have to break the bank account to organize your home efficiently, and to keep your supplies at your fingertips.